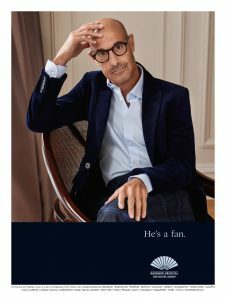 American actor, writer, producer, and film director, Stanley Tucci, is the newest celebrity fan to join Mandarin Oriental’s USD multi-million global advertising campaign “He’s a Fan/She’s a Fan”. The campaign elegantly connects Mandarin Oriental’s well-recognized symbol – the fan – with international celebrities who regularly stay at the Group’s hotels. In appreciation of their support, the Group donates to each celebrity’s individual choice of charity. Tucci has chosen the global UN refugee agency, UNHCR to benefit. Tucci has won three Emmy and two Golden Globe awards and has also had a successful career behind the camera, including writing and directing the critically acclaimed Final Portrait. Outside of work, Tucci is a fan of travelling. He loves exploring cultural sites, his favourite being Florence where he spent much of his childhood. A self-confessed foodie, he has published several cook books and loves finding “perfect places to eat”. When asked to describe Mandarin Oriental, he simply refers to it as ‘the lap of luxury’, and cites his favourite hotel as Mandarin Oriental Hyde Park, London. Well-known portrait photographer Mary McCartney photographs each celebrity in a location of their choice which, for them, best represents a feeling of well-being. Tucci chose to be photographed in the beautifully renovated Mandarin Oriental Hyde Park, London. “The award-winning campaign continues to make a strong statement about the Group in a simple and luxurious manner, and we are delighted to welcome Stanley Tucci as our newest ambassador,” said Jill Kluge, Mandarin Oriental Hotel Group’s Director of Brand Communications. “By focusing on celebrities who evidently appreciate the finer things in life, we have been able to showcase our hotels in a truly unique and interesting way,” she added. Mandarin Oriental’s existing fans are: Chen Kun, Isabelle Huppert, Lucy Liu, Morgan Freeman, Cecilia Bartoli, Caterina Murino, Sir Peter Blake, Karen Mok, Christian Louboutin, Sophie Marceau, Liam Neeson, IM Pei, Michelle Yeoh, Jane Seymour, Kenzo Takada, Jerry Hall, Vanessa Mae, Vivienne Tam, Barry Humphries, Frederick Forsyth, Darcey Bussell, Bryan Ferry, Dame Helen Mirren, Maggie Cheung, Hélène Grimaud, Sa Ding Ding, Geoffrey Rush, Adam Scott, Dev Patel, Christoph Waltz and Stanley Tucci.